Parents believe the benefits of testing their children for the genetic risk of some diseases outweigh the negative consequences, according to US scientists. In the study, published in the journal Pediatrics, parents who were offered a genetic test supported their children also being tested. The authors say doctors and politicians need to be more aware of the issue. Genewatch UK said children should never be tested for adult conditions. 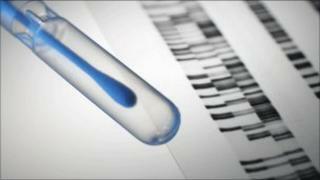 Genetic testing used to be confined to specialist clinics, but direct-to-consumer testing is now possible. People send a sample to a company in the post and are told if they have any genes which carry an increased risk of illness. The report found that "parents offered the genetic susceptibility test for common preventable conditions tended to consider that the potential benefits of this test for their own child could outweigh its risks". Professor Kenneth Tercyak, from the Georgetown Lombardi Comprehensive Cancer Center, said: "These tests usually don't offer a clean bill of health and can be hard to interpret even in the best scenario." Helen Wallace, from genetic science lobby group Genewatch UK, said: "Online gene tests frequently give misleading results because most common conditions such as cancer, obesity or diabetes are not predicable from a person's genes, except in special circumstances. Prof Tercyak said: "The findings of our study should remind clinicians and policy-makers to consider children when regulating genetic tests."